Australian Prime Minister Malcolm Turnbull said Wednesday that he regrets President Donald Trump’s decision to withdraw from the landmark pact. Turnbull is urging all parties involved in the pact to show restraint. World powers involved in the agreement have expressed regret amid concern the move by Trump will undermine efforts to stop the spread of atomic weapons. 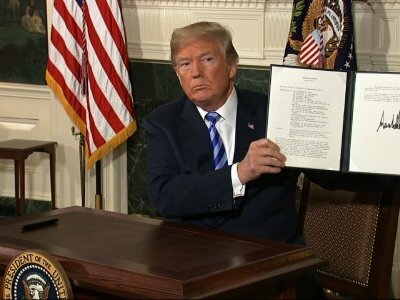 Saudi Arabia says it “supports and welcomes” President Donald Trump’s decision to withdraw from a nuclear agreement reached between Iran and world powers and reimpose sanctions on Iran. Saudi Arabia had tepidly supported the 2015 deal signed by the Obama administration, but held strong reservations about it. Saudi Arabia and Iran are rivals locked in proxy wars for regional supremacy. In a statement published on the state-run news agency late Tuesday, Saudi Arabia says it had supported the nuclear accord in the belief there’s a need to limit the proliferation of weapons of mass destruction in the Middle East. Saudi Arabia says Iran, however, exploited the economic benefits of sanctions being lifted to continue destabilizing activities in the region through the development of ballistic missiles and support for militias — issues not addressed in the accord. Treasury Secretary Steven Mnuchin says licenses Boeing has to sell billions of dollars in commercial jetliners to Iran will be revoked under the action President Donald Trump has taken to withdraw from the Iran nuclear deal. Mnuchin briefed reporters after Trump’s announcement earlier Tuesday. Mnuchin says the existing sales licenses held by Chicago-based Boeing Co. and its European competitor, Netherlands-based Airbus Group, would be invalidated by Trump’s decision. The new sanctions will allow for certain exemptions to be negotiated, but Mnuchin wouldn’t discuss what products might qualify for exemptions. He says the sanctions will also sharply curtail sales of oil by Iran, which is currently the world’s fifth-largest oil producer. Mnuchin says he does not expect oil prices to rise sharply, forecasting that other producers will step up their production. The vice president says economic pressure brought Iran to the negotiating table in the first place. He says the U.S. and its allies can “combine tough-minded American diplomacy and strong economic pressure” to reach a new agreement. President Donald Trump called the deal “defective at its core” when announcing earlier Tuesday that the U.S. would be pulling out. U.N. Secretary-General Antonio Guterres says he is “deeply concerned” at the U.S. decision to pull out of the Iran nuclear deal and calls on the five other signatories “to abide fully” by their commitments. Trump says America “will not be held hostage to nuclear blackmail” and will not allow “a regime that chants ‘Death to America’” to get access to nuclear weapons.